Swingball is a great twist on conventional tetherball allowing kids and adults to play ANYWHERE! You don't have to travel to a local park or school to play Tetherball! With the Swingball and its travel case, it can go everywhere you do! HOW IT WORKS: The All Surface Swingball with Tether is just what the name says! It is ready to play on any flat surface. Just fill the base with water or sand and you're ready for a fun-filled game of Swingball! OBJECTIVE: Use the paddles to hit the ball around against your opponent. The ball swings freely in a circle and travels up and down the spiral pole. Whoever wraps it around the top or bottom of the pole we have a winner. It is a perfect two player game! CREATIVE DESIGN: The Swingball pole is in three sections and the height can easily be adjusted by leaving a section or two out. It stands up to 6' tall! When you have had enough fun, fold everything down into the base...it becomes a carrying case! 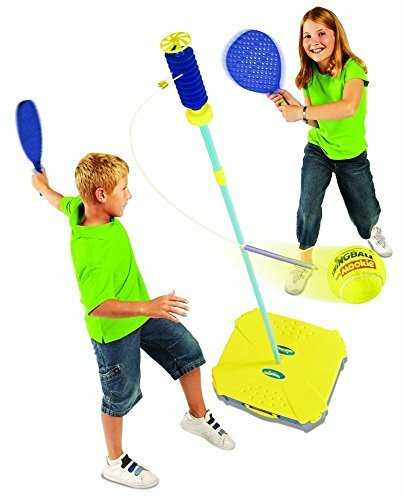 WHAT'S INCLUDED: 2 Paddles, 1 Swingball on a rope, 6' pole that breaks into 3 sections, and the base which doubles as a carrying case! INTENDED USE: Swingball will provide hours of fun for anyone 6 years and up! Swingball is the fun and portable version of traditional Tetherball so you can play anywhere there is a flat surface! If you have any questions about this product by Squirrel Products, contact us by completing and submitting the form below. If you are looking for a specif part number, please include it with your message.